Detained Venezuelan human rights lawyers Orlanda Gonzalez (fourth from the left) and Oscar Rios (second from the right) with colleagues from Foro Penal. According to Raquel Sanchez, FAES arrived in Táchira a month or two ago together with Minister of government Freddy Bernal who is a so called ”protector” of the state. FAES and Bernal have since then detained at least 200 people without legal ground, accusing them of being part of an ”economic war” against Venezuela. Orlando Gonzalez and Oscar Rios have been defending a number of these individuals and were detained when visiting the business of one of them. 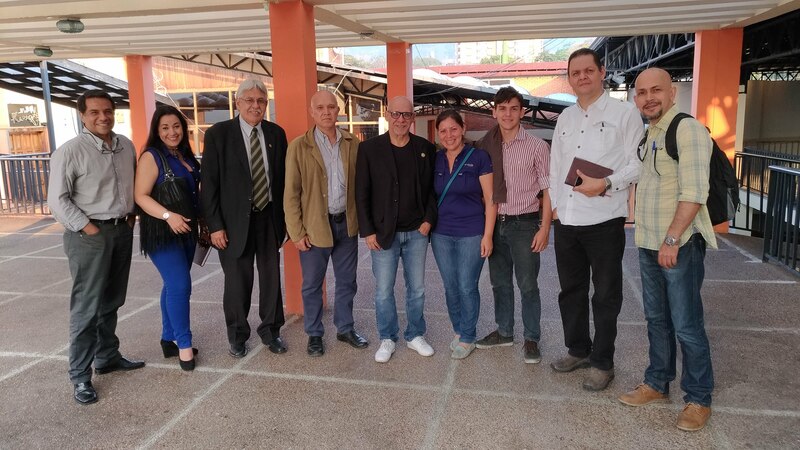 Foro Penal is a longtime partner of Civil Rights Defenders, and we have visited their Tachira chapter at several occasions the last couple of years. When we met with Orlando and Oscar in San Cristobal, the capital of Táchira, in March this year, they were both very worried about the deteriorating human rights situation in the country, and the ambitions of the government to even tighten its grip over the political and economic systems after the presidential elections on Sunday. San Cristobal and Tachira have been strongholds of the Venezuelan opposition for many years, which resulted in some of the largest demonstrations in the country during the protests 2017, and consequently some of the most violent acts of repression by the authorities. Situated on the border with Colombia, thousands of people arrive in the state every week on their way to leave the country. The mayor of San Cristobal declared the city in state of emergency earlier this year because of the social and economic crisis. Civil Rights Defenders call for the immediate release of Orlando Gonzalez and Oscar Rios, as well as all other political prisoners and detained democracy activists in the country. Foro Penal is one of the most important and prominent human rights organisations in Venezuela. It consists of more than 200 lawyers and more than 2000 volunteers, working pro bono for political prisoners and activists detained at demonstrations. Foro Penal also keep statistics on human rights violations, and has a wide network of Venezuelans in exile promoting the work of the organisation.